A beloved sport originating in Spain was brought to the Rio Grande Valley almost two decades ago. 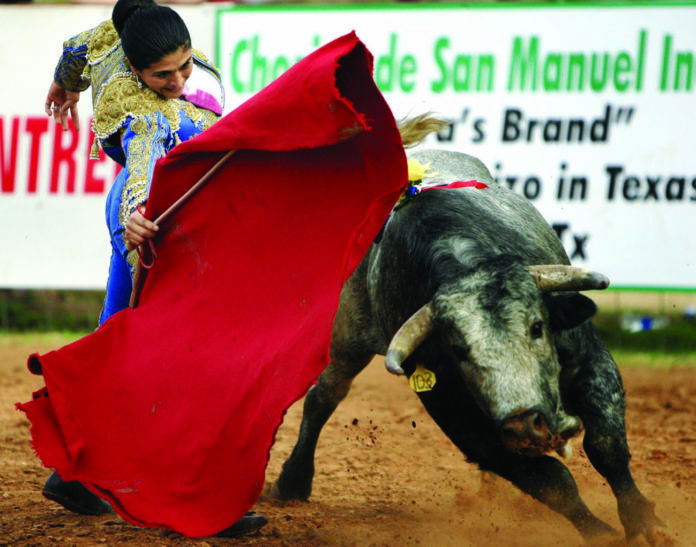 The 19th annual Bloodless Bullfight season began Dec. 8, and performances are held nearly every Saturday through March 9 at the Santa Maria Bullring, which is located at 4877 FM 1017, La Gloria. In other countries, the bull is initially weakened by a picador who spears it and draws blood. Here, the bulls are not harmed, making the sport humane for them, but more dangerous for the fighters. A bull can maintain its full strength for 30 minutes straight and outrun a horse in the first 100 yards. Fred Renk, ring owner and longtime bullfighter, said that the sport is important to the latino culture and encourages anyone who is not familiar with bullfighting, to learn. Renk says that the practice here is special, since the bull is protected. In 1981, Fred Renk’s son David became the sixth American to be named matador when he was just 18 years old. David was the last American matador to hold that honor; he died in September 2018. On Sunday, world-renowned matador Rocio Morelli will be challenging a 1,000 pound animal in the ring at 4 p.m. She is a native of Bogota, Colombia, and is one of four female matadors in the world. Tickets on the sunny side of the arena are $30, while seats in the shade are $35 and reserved box seats are $40. Tickets can be purchased online at olebullfighting.com, or at the gate.